'Kiss them for me' was written by Siouxsie & the Banshees and produced by Stephen Hague. It was released in 1991 as the first single from the band's tenth studio album 'Superstition'. 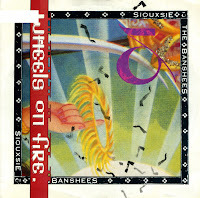 The song presented a change in musical direction for Siouxsie & the Banshees — adopting a much more straightforward pop-oriented feel than previous tracks, due in large part to Hague's production work. The single became their biggest hit in the USA, peaking at number 23 in the US Billboard Hot 100. In the UK, the single reached number 32. 'This wheel's on fire' was originally written by Bob Dylan and Rick Danko. Dylan and The Band recorded it in 1967, a recording that finally surfaced in 1975 on the album 'The basement tapes'. In 1968, a version by Julie Driscoll, Brian Auger and the Trinity became a top 5 hit in the UK. In 1987, Siouxie and the Banshees recorded another cover version of the song for their album 'Through the looking glass', which consisted entirely of covers. Released as the first single from that album, it climbed to number 14 on the UK singles chart. 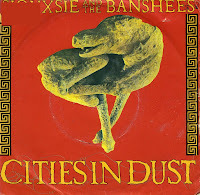 'Cities in dust' was released as the first single from the seventh studio album by Siouxie and the Banshees: 'Tinderbox' (1985). The lyric of the song obliquely describes the city of Pompeii, destroyed in a volcanic eruption in the year 79. Imagery describing the volcano and its magma chamber, the condition of the victims of the eruption, and the subsequent discovery and excavation of the city comprises the bulk of the lyrics. Although the subject matter was still dark, the band seemed to be headed in a more poppy area of music, leaving their goth roots. The single made number 21 in the UK singles chart. 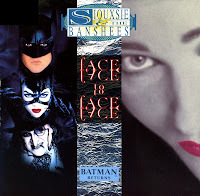 Siouxie and the Banshees recorded 'Face to face' for the soundtrack of the movie 'Batman Returns'. Thanks to Danny Elfman's involvement in the writing of the song (which was co-written with the band), it features elements from his score to the film. 'Face to face' peaked at number 21 in the UK singles chart. I got to know this song because a friend of mine was (and still is) addicted to Batman movies. Lord knows why - I always had a prejudice against them because superhero movies are usually mindblowingly boring. So I didn't see the movie, and only got to hear this song some time after its release. But when I did, I wanted to have it. When I was in highschool, I had a classmate who was wild about Siouxie and the Banshees. I think he owned all of their records. I got to know them through this single, a cover of the song by the Beatles. I'd heard the original two or three times, but I preferred this to the original pretty quickly. 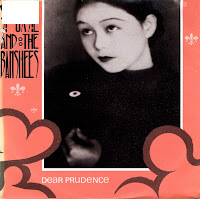 'Dear Prudence' wasn't a hit in the Netherlands, however it peaked at number 3 in the UK singles charts, making it their biggest hit in that country.